Steven Millies discusses Good Intentions: A History of Catholic Voters' Road from Roe to Trump. He will be joined in conversation by Miguel H. Díaz. A Q&A and signing will follow the discussion. About the book: The 2016 presidential election was unlike any other in American history. Polls tell us that millions of American Catholics who care about moral issues and who descended from immigrants supported Donald Trump. Why didn’t Trump’s rhetoric on immigration and his promises to close the borders trouble more American Catholics? Despite his own vulgar behavior, his unconcealed selfishness, or his still-recent support for abortion rights, why were some serious Catholics drawn to Trump? 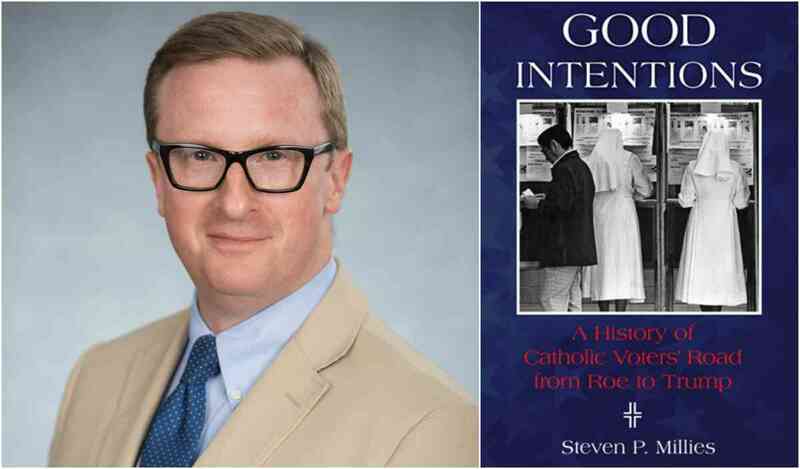 In Good Intentions Steven P. Millies uncovers the history of how American Catholics came to this. More than that, Good Intentions offers an explanation for why Catholics behaved the way they did in 2016 with some practical reflections about how to put Catholic faith to better use in American politics. About the author: Steven P. Millies is associate professor of public theology and director of The Bernardin Center at Catholic Theological Union in Chicago. He studied politics at The Catholic University of America and has written widely about Catholicism and American politics. He is the author of Joseph Bernardin: Seeking Common Ground (Liturgical Press). About the interlocutor: Miguel H. Díaz is the John Courtney Murray University Chair in Public Service and was selected by President Barack Obama as the 9th U.S. Ambassador to the Holy See. Prof. Díaz obtained his doctorate in Systematic Theology from the University of Notre Dame. Prof. Diaz regularly contributes to efforts that bridge faith and public life. He has been a consultant to CNN, CNN en Español, Al Jazeera America, The Charlie Rose Show, BBC News, and Fox News.